Home Where do your donations go? The KANO Foundation relies on the generosity of our supporters to Keep Football Free for Kids. We are fully fan-funded and could not do any of this without your help. Our season tickets (116 kids and 19 adults) are purchased at full price, using donated funds and by seat sponsors. 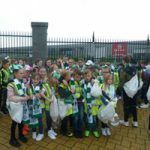 Each child who joins us at a match receives a goody bag that includes a Kano scarf, wristband, crisps, juice, a sweet and a voucher to use at the food stalls once inside the stadium. Each bag costs approximately £7.50. Our basic annual running costs for the season are approximately £20,000. We really could not provide these match-day experiences without your donations and support of our fundraising activities. We are now in our 6th season and have taken over 6000 children ‘over the turnstile’ and enjoyed each and every minute of it. We are now targeting our own 10-in-a-row. 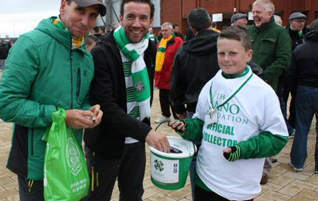 Our aim is to ensure we always have funds in the bank to cover our running costs for the next three seasons, providing security and longevity to our charity and enabling us to take thousands more children to watch Celtic for years to come, free of charge. From everyone involved with The KANO Foundation, and all of the groups that have joined us as a result of your generosity, THANK YOU! !